Hi floor bore here again and i'm sure after the exhilirating ride of "The Art of Floor Sanding (part 3)" You've been excitedly waiting for part 4! SIXTY GRIT! ...The gateway to SMOOTHNESS! Sixty grit is an essential grade of abrasive . It is the grit that takes your floors from rough grade through and out the otherside to smoothness! There are a fews way to navigate through the gateway. Let us suppose we have a fairly rough wood floor that needs flattening. We would probably use a 24/36/or 40 grit on our belt sander to do this, and as mentioned before, we would sand slightly diagonally across the grain . If we start with a 24 grit on a very uneven floor we would then sand diagonally in the opposite direction with a 40 grit removing the 24 grit scratches. 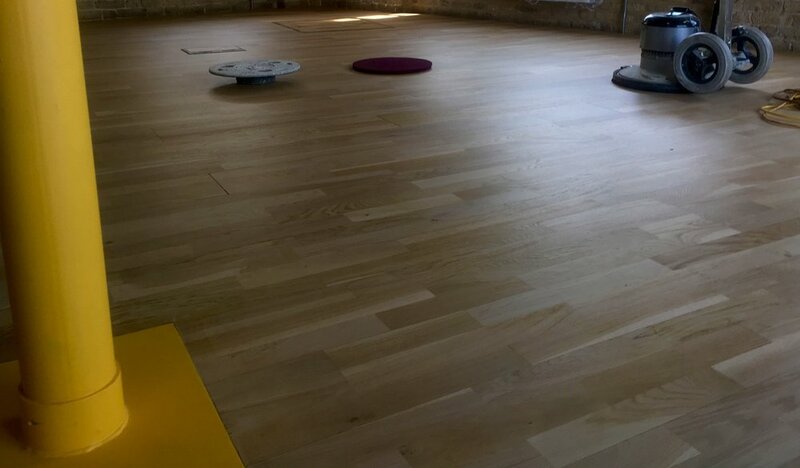 Then using our lights we would go over the floor and further smooth out the scratches with our 40 grit. We would then edge the floor accordingly bringing the whole floor to a flat surface with 40 grit scratches. remove these scratches with 60 grit papers. There are a few good reasons for keeping the use of our belt machine only to these coarse grits. Belt sanding machines are very powerful tools that can leave their own marks and also create "end grain dishout"
This is a problem that occurs when belt machines are used with finer grade papers. On certain woods the finer papers are not strong enough to sand the knots in the wood but carry on sanding the softer wood in between the knots creating uneveness in the floor. This is also another reason not to sand along the grain! The main point here is to use the belt machine for flattening the floors and then switch to our lighter rotary sanding machine at a point where the rotary machine can easily remove the diagonal scratches of the 40 grit belts. There are in fact many combinations that can work here depending on the machines used, make of sandpaper and the type of wood floor. I will talk about our machines and abrasives in another chapter.